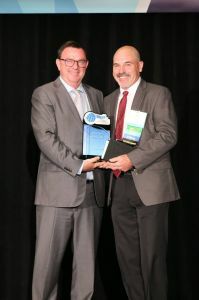 Nylatech is proud to share that Dale Delmage, our President/CEO was presented with the 2015 Paul Davis Award of Merit at the 59th Annual International Association of Plastics Distribution Convention in San Diego. Delmage was honored for his many years of outstanding personal and professional contributions to the association and the plastics industry. Since the early 1990s, Delmage has been a fixture at every IAPD convention and he has been a tireless volunteer in IAPD activities and committees. He has also been one of the driving forces behind the Education Committee, making it one of the most valuable services IAPD has to offer its members. He has been a key volunteer when developing education projects, including the Plastics Certificate Courses Levels 1 and 2, the Excellence in Sales Certificate Courses, numerous editions of the Introduction to Plastics and the PVF Certificate Course. "Under Dale's leadership, Nylatech uses the IAPD training materials throughout the organization and he promotes them to every distributor with whom he works. He has also been instrumental in developing a successful internship program, and you can hear him talk about that first-hand on the IAPD website," said IAPD CEO Susan E. Avery, CAE. "He is truly one of the 'nice guys' in the industry who has dedicated his career in growing and expanding the use of all performance plastics." Delmage is the president and chief executive officer of Nylatech, Inc., based in Everson, WA, USA. He joined Redwood Plastics Corporation, A Member of Prisma Plastics international Inc., in 1981 after spending a few years in university studying geology. After deciding that a career as a geologist wasn't right for him, he started work as an inside sales representative at Redwood Plastics, going on to work in all aspects of sales and management. In 2010, Delmage became president and CEO of Nylatech and has been responsible for developing the company into what it has become today. He has a unique perspective of the industry, as he has worked on both the distributor side and the manufacturer side. Congratulations Dale on this very prestigious award!